Among our NH3 (anhydrous ammonia) meter matics accessories we offer repair kits and setting decals. 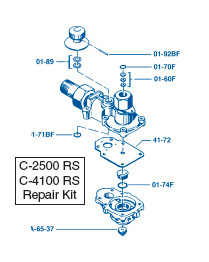 Meter Matic Repair Kits contain the necessary parts to perform most field overhaul repair jobs. Meters requiring extensive services should be sent to the factory for a complete overhaul. Kits are available for all series of Meter Matics. Meter Matic Setting Decals are made with a weatherproofing vinyl to stick on toolbars or applicators for easy reference. Setting decals are available in various swath widths and application settings. 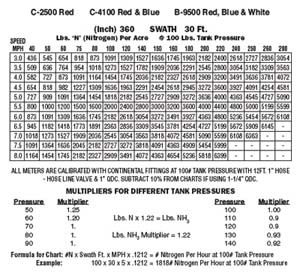 A tank pressure multiplier decal is also available which can be used on any of the C Series Meter Matics and new style B-9500.